Russian defense ministry says 'irresponsible' Israeli actions during strike in Syria responsible for downing of Russian spy plane. 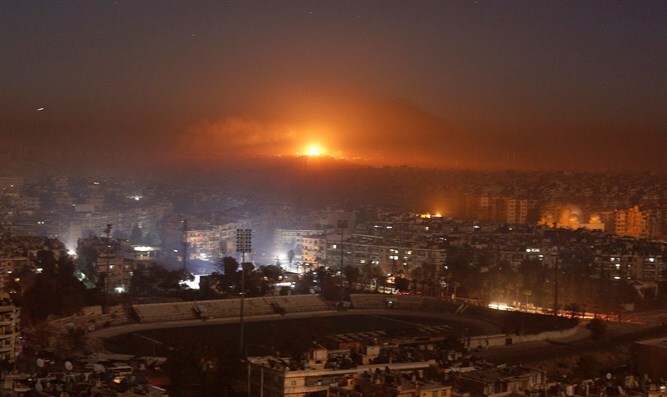 The Russian Defense Ministry issued an unusual announcement that Syrian anti-aircraft systems activated Tuesday night in the wake of the Israeli attack in Syria were what downed the Russian transport plane last night. The spokesman condemned Israel's "irresponsible actions" and said that Moscow reserved its right to take appropriate measures after Israel's "hostile action." "Israel created a deliberate provocation, it is inconceivable that the IDF did not see the Russian planes that were preparing to land," the Russian defense ministry said. In the meantime, Israel is maintaining ambiguity and is not addressing Moscow's unprecedented claims against IDF activity.